Sustainability - Operational Highlights - Carrizo Oil & Gas, Inc. In this section, we highlight some of the key operational metrics that drive our business, as well as our financial performance over the last five years. More complete information can be found in our various SEC filings and press releases. This sustainability report contains measures which may be deemed "non-GAAP financial measures" as defined in Item 10 of Regulation S-K of the Securities Exchange Act of 1934, as amended. 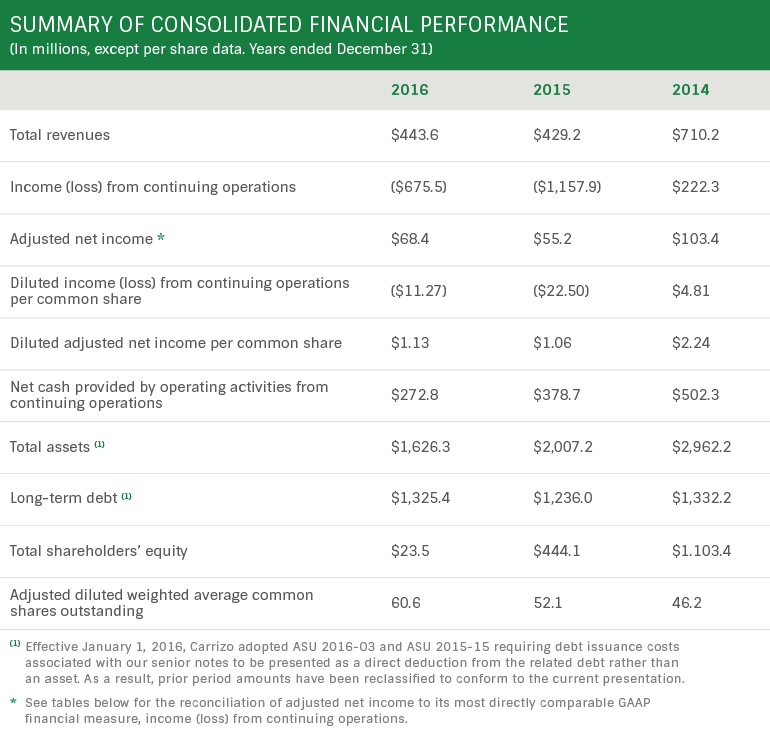 Adjusted net income is a non-GAAP financial measure which excludes certain items that are included in income (loss) from continuing operations, the most directly comparable GAAP financial measure. Items excluded are those which the Company believes affect the comparability of operating results and typically excluded from published estimates by the investment community, including items whose timing and/or amount cannot be reasonably estimated or are non-recurring. Adjusted net income is presented because management believes it provides useful additional information to investors for analysis of the Company’s fundamental business on a recurring basis. 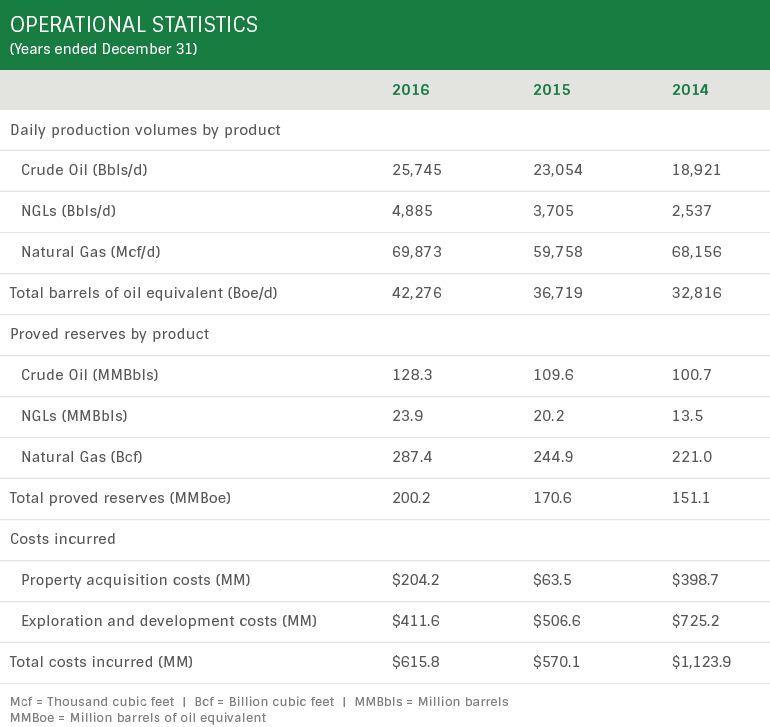 In addition, management believes that adjusted net income is widely used by professional research analysts and others in the valuation, comparison, and investment recommendations of companies in the oil and gas exploration and production industry. Adjusted net income should not be considered in isolation or as a substitute for income (loss) from continuing operations or any other measure of a company’s financial performance or profitability presented in accordance with GAAP. A reconciliation of the differences between income (loss) from continuing operations and adjusted net income is presented below. Because adjusted net income excludes some, but not all, items that affect income (loss) from continuing operations and may vary among companies, our calculation of adjusted net income may not be comparable to similarly titled measures of other companies. Adjusted diluted weighted average common shares outstanding (“Adjusted Diluted WASO”) is a non-GAAP financial measure which includes the effect of potentially dilutive instruments that, under certain circumstances described below, are excluded from diluted weighted average common shares outstanding (“Diluted WASO”), the most directly comparable GAAP financial measure. When a loss from continuing operations exists, all potentially dilutive instruments are anti-dilutive to the loss from continuing operations per common share and therefore excluded from the computation of Diluted WASO. The effect of potentially-dilutive instruments is included in the computation of Adjusted Diluted WASO for purposes of computing diluted adjusted net income per common share. None of the information furnished above will be deemed “filed” for purposes of Section 18 of the Securities Exchange Act of 1934, as amended, nor will it be incorporated by reference into any registration statement filed by the Company under the Securities Act of 1933, as amended, unless specifically identified therein as being incorporated therein by reference. The furnishing of the information above is not intended to, and does not, constitute a determination or admission by the Company, that the information is material or complete, or that investors should consider this information before making an investment decision with respect to any security of the Company. Copyright © 2009- Carrizo oil and gas. All rights Reserved.